Sir Banastre Tarleton, 1st Baronet, GCB (21 August 1754 – 15 January 1833) was a British soldier and politician. Tarleton was eventually ranked as a general years after his service in the colonies during the American Revolutionary War, and afterwards did not lead troops into battle. 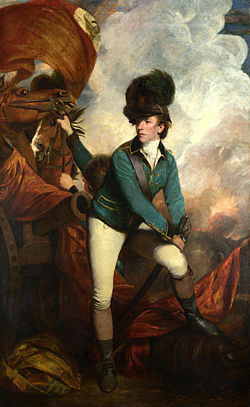 Lieutenant-Colonel Banastre Tarleton by Sir Joshua Reynolds, in the uniform of the British Legion, wearing a "Tarleton Helmet". Tarleton's cavalrymen were called 'Tarleton's Raiders'. His green uniform was the standard uniform of the British Legion, a provincial unit organised in New York, in 1778. After returning to Great Britain in 1781 at the age of 27, Tarleton was elected a Member of Parliament for Liverpool and returned to office in the early 19th century. As such, Tarleton became a prominent Whig politician despite his young man's reputation as a roué. Given the importance of the slave trade to the British shipping industry in Liverpool, Tarleton strongly supported slavery as an economic means. Banastre Tarleton was the third of seven children born to the merchant John Tarleton (1718–1773), who served as Mayor of Liverpool in 1764 and had extensive trading links with Britain's American colonies. His paternal grandfather Thomas Tarleton had been a shipowner and slave trader. Banastre's younger brother John (1755–1841) entered the family business. He was elected as a Member of Parliament (MP). Tarleton was educated at the Middle Temple, London and went to University College, Oxford, in 1771, preparing for a career as a lawyer. In 1773 at the age of 19, he inherited £5,000 on his father's death. He squandered almost all of it in less than a year on gambling and women, mostly at the Cocoa Tree club in London. In 1775 he purchased a commission as a cavalry officer (Cornet) in the 1st Dragoon Guards, where he proved to be a gifted horseman and leader of troops. Owing to his abilities, he worked his way up through the ranks to Lieutenant Colonel without having to purchase any further commissions. In December 1775, at the age of 21, the volunteer-soldier Banastre Tarleton sailed from Cork to North America, where the American Revolutionary War (1775–83) had broken out. Tarleton sailed with Lord Cornwallis as part of an expedition to capture the southern city of Charleston, South Carolina. After that expedition failed, at the Battle of Sullivan's Island (28 June 1776), Tarleton joined the main British Army under command of General William Howe, in New York City. In the course of the colonial war in North America, Cornet Tarleton's campaign service during 1776 earned him promotion to brigade major of cavalry at the end of the year; he was twenty-two years old. Major Tarleton was at the Battle of Brandywine and at other battles in the campaigns of 1777 and 1778. One such battle, in 1778, was an attack upon a communications outpost in Easttown Township, Chester County, Pennsylvania, which was guarded by troops commanded by Capt. Henry Lee III, of the Continental Army, who repulsed the British attack, and in which Major Tarleton was wounded. After becoming commander of the British Legion, a force of American Loyalist cavalry and light infantry, also called Tarleton's Raiders, Tarleton went to South Carolina, at the beginning of 1780. There, Tarleton's Raiders supported Sir Henry Clinton in the siege operations that culminated in the capture of Charleston. The siege and capture of the city were part of the British strategy in the southern military theatre meant to restore royal authority over the southern colonies of British North America. After Tarleton's first major victory at Monck's Corner, during the Siege of Charleston, a soldier of the British Legion was involved in an attempted sexual assault that entered legend. The attack by one of Tarleton's soldiers against a civilian woman in the area was halted by one of his companions. On 29 May 1780, Colonel Tarleton, with a force of 149 mounted soldiers, overtook a detachment of 350 to 380 Virginia Continentals, led by Colonel Abraham Buford, who refused to surrender or to stop his march. Only after sustaining many casualties did Buford order the American soldiers to surrender. Nonetheless, Tarleton's forces ignored the white flag and massacred the soldiers of Buford's detachment; 113 American soldiers were killed, 203 were captured, and 150 were severely-wounded. The British army casualties were 5 soldiers killed and 12 soldiers wounded. From the perspective of the British Army, the affair of the massacre is known as the Battle of Waxhaw Creek. In that time, the American rebels used the phrase 'Tarleton's quarter' (shooting after surrender) as meaning 'no quarter offered'. In the 19th century, American historians represented Tarleton as a ruthless butcher, whilst the perspective of some contemporary historians has changed in this regard. An eye-witness, the American field surgeon Robert Brownfield, wrote that Colonel Buford raised the white flag of surrender to the British Legion, "expecting the usual treatment sanctioned by civilized warfare"; yet, while Buford called for quarter, Colonel Tarleton's horse was shot with a musket ball, felling horse and man. On seeing that, the Loyalist cavalrymen believed that the Virginia Continentals had shot their commander — while they asked him for mercy. Enraged, the Loyalist troops attacked the Virginians with an "indiscriminate carnage never surpassed by the most ruthless atrocities of the most barbarous savages"; in the aftermath, the British Legion soldiers killed wounded American soldiers where they lay. Colonel Tarleton's account, published in 1787, said that his horse had been shot from under him, and that his soldiers, thinking him dead, engaged in "a vindictive asperity not easily restrained". On the other hand, Tarleton advocated repression, and criticized the mildness of Lord Cornwallis's methods, because moderation "did not reconcile enemies, but . . . discourages friends". Regardless of the extent to which they were true or false, the reports of British atrocities motivated Whig-leaning colonials to support the American Revolution. In the event, on 7 October 1780, at the Battle of Kings Mountain, South Carolina, soldiers of the Continental Army, having heard of the slaughter at Waxhaw Creek, killed surrendering American Loyalists, after a sniper killed their British commanding officer, Maj. Patrick Ferguson. In South Carolina, Col. Tarleton's British Legion were harried by Francis Marion, 'The Swamp Fox', an American militia commander who practiced guerrilla warfare against the British. Throughout the campaigns, Tarleton was unable to capture him or thwart his operations. Marion's local popularity among anti-British South Carolinians ensured continual aid and comfort for the American cause. In contrast, Colonel Tarleton alienated the colonial citizens with arbitrary confiscations of cattle and food stocks. Tarleton materially helped Cornwallis to win the Battle of Camden in August 1780. He defeated Thomas Sumter at Fishing Creek, aka "Catawba Fords", but was less successful when he encountered the same general at Blackstock's Farm in November 1780. On 17 January 1781 Tarleton's forces were virtually destroyed by American Brigadier General Daniel Morgan at the Battle of Cowpens. Tarleton and about 200 men escaped the battlefield. Retreating from his defeat at the Battle of Cowpens, Tarleton was able to escape capture by forcing a local plantation owner, Adam Goudylock, to serve as a guide. He was successful in a skirmish at Torrence's Tavern while the British crossed the Catawba River (Cowan's Ford Skirmish 1 February 1781) and took part in the Battle of Guilford Courthouse in March 1781. With his men, Tarleton marched with Cornwallis into Virginia. There he carried out a series of small expeditions while in Virginia. Among them was a raid on Charlottesville, where the state government had relocated following the British occupation of the capital at Richmond. He was trying to capture Governor Thomas Jefferson and members of the Virginia legislature. The raid was partially foiled, and Jefferson and all but seven of the legislators escaped over the mountains. Tarleton destroyed arms and munitions and succeeded in dispersing the Assembly. In July 1781 some of his forces allegedly were involved in Francisco's Fight, an alleged skirmish between colonial Peter Francisco and nine of Tarleton's dragoons, which resulted in one dead, eight wounded and Francisco capturing eight horses. After other missions, Cornwallis instructed Tarleton to hold Gloucester Point, during the Siege of Yorktown. On 4 October 1781, the French Lauzun's Legion and the British cavalry, commanded by Tarleton, skirmished at Gloucester Point. Tarleton was unhorsed, and Lauzun's Legion drove the British within their lines, before being ordered to withdraw by the Marquis de Choisy. The Legion suffered three Hussars killed, and two officers and eleven Hussars wounded. Fifty British were killed or wounded, including Tarleton. The British surrendered Gloucester Point to the French and Americans after the surrender at Yorktown, Virginia in October 1781. After the surrender, the senior British officers were invited to dinner by their American captors, and the only one not to get an invitation was Tarleton. He returned to Britain on parole, finished with this war at the age of 27. Tarleton had lost two fingers from a bullet received in his right hand in the Battle of Guilford Courthouse, but "his crippled hand was to prove an electoral asset" back home. The condition of his hand is disguised in the pose of his 1782 portrait (shown in this article) by Sir Joshua Reynolds. After his return to Great Britain, Tarleton wrote a history of his experience in the war in North America, entitled Campaigns of 1780 and 1781 in the Southern Provinces of North America (London, 1781). He portrayed his own actions in the Carolinas favourably and questioned decisions made by Cornwallis. It was criticized by Lieutenant Roderick Mackenzie in his Strictures on Lieutenant-Colonel Tarleton's History (1781) and in the Cornwallis Correspondence. In 1784, Tarleton stood for election as M.P. for Liverpool, but was narrowly defeated. In 1790 he succeeded Richard Pennant as MP for Liverpool in the Parliament of Great Britain and, with the exception of a single year, was re-elected to the House of Commons until 1812. He was a supporter of Charles James Fox despite their opposing views on the British role in the American War of Independence. Tarleton spoke on military matters and a variety of other subjects. He is especially noted for supporting the slave trade, which was highly important to the port of Liverpool as one of the UK's most prominent port cities at the time and still to date. Tarleton was working to preserve the slavery business with his brothers Clayton and Thomas, and he became well known for his taunting and mockery of the abolitionists. He generally voted with the Parliamentary opposition. When the Fox-North Coalition came to power, he supported the government nominally headed by William Cavendish-Bentinck, 3rd Duke of Portland. [dubious – discuss]He was rewarded with the title of Governor of Berwick and Holy Island. In 1794, Tarleton was promoted to Major-General, in 1801 to Lieutenant-General and in 1812 to General, but he never again led troops into battle. He had hoped to be appointed to command British forces in the Peninsular War, but the position was instead given to Wellington. He held a military command in Ireland and another in England. In 1815, he was made a baronet and in 1820 a Knight Grand Cross of the Order of the Bath (GCB). For 15 years, he had a relationship with the actress and writer Mary Robinson (Perdita), whom he initially seduced on a bet. She was an ex-mistress of the future King George IV while he was still Prince of Wales. Tarleton and Robinson had no children; in 1783 Robinson had a miscarriage. She was important to his parliamentary career, writing many of his speeches. His portrait was painted by both Joshua Reynolds, who showed him at battle in the American Revolution, and Thomas Gainsborough. Tarleton ultimately married Susan Bertie, the young, illegitimate and wealthy daughter of the 4th Duke of Ancaster in 1798. They had no children. Tarleton did however, father an illegitimate daughter in 1797, prior to his marriage. The child was named Banina Georgina (1797–1818), her mother being named simply as Kolina. The house at the site of his defeat in Pennsylvania came to be known as "Tarleton." The Tarleton Nursery School in Berwyn, Pennsylvania, appears to have been named for him. The "General Tarleton Inn" in Ferrensby, North Yorkshire, is named after him. "We honor the rough soldier Ferguson for the fiat of instant death with which he would have requited the most infamous and dastardly outrage that brutalizes warfare." Tarleton, on the other hand, reveled in his own misconduct and that of his soldiers. In the 1986 film Sweet Liberty Tarleton is played by actor Michael Caine and portrayed to the history professor Michael Burgess' (Alan Alda) dismay as a romantic, dashing hero. In the 2000 film The Patriot, the fictitious Colonel William Tavington (played by Jason Isaacs) was based on Tarleton. In the episode "The Sin Eater" of the 2013 TV series Sleepy Hollow, a villainous British army officer named "Colonel Tarleton," played by actor Craig Parker, is featured as the commander of protagonist Ichabod Crane. during a flashback to Crane's service in the Revolutionary War. Other than the name and his cruelty towards accused colonial rebels, it is unclear whether or not the character is based on the historical Tarleton. He turns out to be a demon disguised in human form, and is listed in the credits only as "Tarleton Demon." In November 2005, it was announced that four rare battle flags or regimental colours seized in 1779 and 1780 from American soldiers by Tarleton and still held in Britain, would be auctioned by Sotheby's in New York City in 2006. Two of these colours were the Guidon of the 2nd Continental Light Dragoons, captured in 1779; and a "beaver" standard – possibly a Gostelowe List Standard No. 7 dating from 1778. The "Beaver" Standard and two other flags (possibly division colours) were apparently captured at the Waxhaw Massacre. The flags were sold at auction on Flag Day in the United States (14 June 2006). Tarleton introduced to the British Legion, and wore himself, a leather helmet with antique style applications and a fur plume (woollen for lower ranks) protruding far into the upper front side. It is depicted in Sir Joshua Reynolds' portrait of Tarleton above and was named after the officer. The helmet was used by British horse artillery troops until the end of the Napoleonic Wars. It was based off Continental European designs that became popular in several other armies before it fell out of fashion. One such design became the standard-issue headgear of various units in the Bavarian Army until abolished and substituted by the German Reichs typical Pickelhaube after Ludwig II of Bavaria's death in 1886. Bass, Robert D. The Green Dragoon, Sandlapper Pub. Co. 500pp. 2003. ^ "Township History Archived 16 March 2014 at the Wayback Machine", Easttown Township; accessed 2014.01.16.